Animals will instinctively hide when they are sick, not feeling well, or in pain. This is to protect themselves in a “pack” situation, where other animals might exclude them or even harm them if it is discovered that they are not healthy. However, there are still things that you can do that will help you identify when your pet requires care. Regular visits to your local veterinary clinic in Dartmouth can help, and knowledge about what types of situations require urgent assistance at your trusted emergency veterinary hospital can help. Beyond that, learning all you can about year-round issues and potential hazards, such as our winter tips for small pets, cats, and dogs, will help you to spot out issues that might otherwise be missed. One of the biggest issues – and we discuss it here on the blog a lot – is keeping your pets warm in the winter. New England winters are no joke! While some breeds, such as Huskies or Malamutes, which were bread with thick coats and undercoats designed to keep them warm in the Arctic region might be okay with a quick run around the block in the snow, your Chihuahua or Jack Russell terrier will need some help. Dog sweaters might look silly, but there are many brands that design them specifically to protect from temperature and weather conditions. Snow can stick to the fur, increasing risk for hypothermia, so preventing this from happening is essential. Booties are also beneficial in that they protect the feet from direct contact with snow and ice to reduce frostbite, as well as salt and de-icing products that can burn sensitive paw pads. 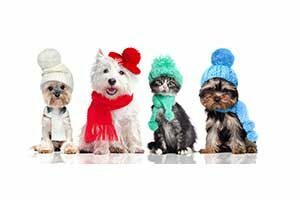 Running the heater or keeping a fireplace going throughout the winter creates a warm environment for you and your pet. However, warming up the home can lead to dryer air. Winter dehydration is just as much of a risk as summer dehydration for both pets and people. Symptoms are often overlooked, as they could easily be chalked up to indoor boredom, including sleeping more, feeling lethargic or issues with the skin. Other symptoms, including vomiting, sticky gums, sunken eyes, and tenting of the skin might be perplexing to many Westport pet owners. If you notice any of these symptoms contact your veterinary clinic in Dartmouth or bring your pet immediately to an emergency veterinary hospital. Make sure to provide clean, fresh water daily for your pets and check to make sure the bowl stays full throughout the day. Pets often won’t drink as much in the winter as they do in the summer, so it should be encouraged. Pets require water for digestion and other bodily functions to work properly, so this is one of the most crucial winter tips for small pets and larger ones as well. Another common issue that pet owners have to deal with in the winter is pest prevention. While a lot of people think that parasites like fleas and ticks die off when the temperature drops below a certain point, this just is not true. While they are not as common as they are during the warmer months, fleas and ticks can still be a problem. Pets who visit doggie daycares, parks, spend time in boarding over the holidays, or interact with other animals can come in contact with fleas and ticks just as they would any other time of year. Prevention should be year-round for heartworm, fleas, and ticks. In some cases, milder winters can make flea and tick problems even more intense, so the best course of action is to just continue the monthly preventive just in case. There are many things that Westport pet owners need to be aware of year-round to prevent their pets from ending up at the local emergency veterinary hospital. Knowing what to look out for can really help to avoid injuries or urgent situations that could put your dog, cat or any other type of pet’s life in danger. Read all of the seasonal tips for common problems like chemicals, cleaning supplies, gardening tools, and automotive fluids that are often used more in the winter or other times of the year that can result in serious problems. Holiday decorations, independent heaters and appliances, celebration fireworks, and seasonal storms are just some of the things that can lead pets into danger. The more you can learn about your pet’s needs, the easier it will be to keep them safe. Time to schedule your pet’s annual veterinary check-up? Contact our veterinary clinic in Dartmouth to make an appointment right away. You can reach our friendly and knowledgeable staff by dialing 508-996-3731. We can answer any questions that you might have about our veterinary services, which include advanced dentistry, surgery, and emergency veterinary hospital care or provide you with information on vaccinations and other preventive treatments.